Hawaiian racers gathered this past Saturday on the island of Oahu for the Hawaii Winter Outlaw Series event 3... 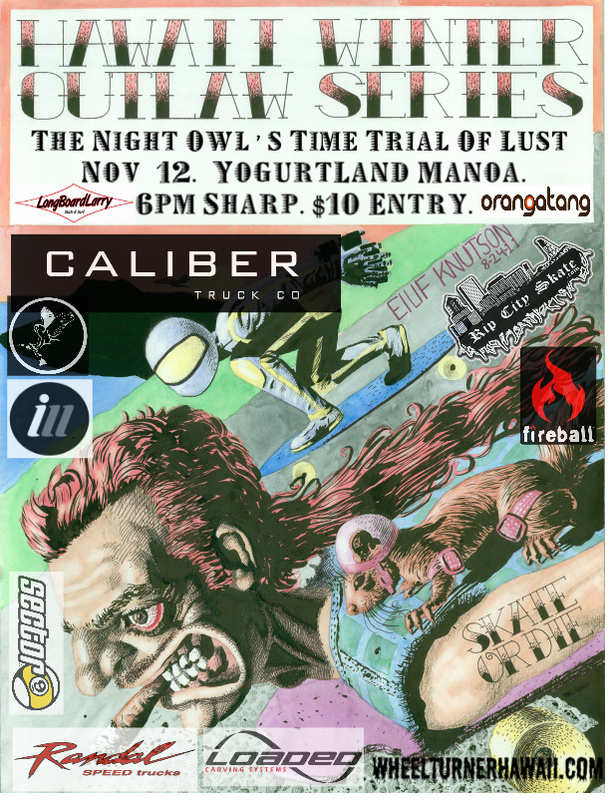 The night owl's time trial of lust. This event marked out half way point and we have had nothing but positive vibes and gnarly skateboarding so far this season. Unlike the first 2 events of the series this race was held on an open public road. Because of this we decided to run the event during the night, allowing riders to see car headlights from far and take safer lines. It was also a time trial, so riders had nothing to worry about but racing the clock. Skaters met right at sundown at the agreed meet spot ( to avoid heat on the hill ) where they all signed up, and were briefed on what they were to do when arriving to the hill. Once everyone had their gear set up and were ready to skate we headed over to the well known Tantalus. We all got there just in time for the sun to set. On the top of the mountain next to out start line is a long, hidden hiking trail where everyone waited for their turn. This spot was perfect! Cars would pass and not even see our group of 27 racers. Everyone skated their run on the race course of 8 high speed hairpins by them selves, in the dark, with no street lights. To some this was a daily routine, while others were just popping their nocturnal Tantalus cherry. Once completing their run and receiving their time, riders would disappear into another hidden hiking trail at the bottom of the run. Totally ninja. The conditions for the TT were prime. Clear skies, full moon, with very little rain... amazing considering it was week every day for the 2 weeks leading up to the race. Once all 27 riders had completed their single timed run and regrouped, i announced that the top 4 racers would be racing " pines & the repeaters"... the fastest , most tech part of Tantalus. Our top timing racer seemed to vanish so we grabbed the next person down the list, lined the finalist up and sent them down the hill. The skaters kicked into the hill full blast, letting the darkness barley affect them. Everyone went around the first hair pin close and stayed TIGHT through Pines, a long fast straight. As they approach the repeaters they each start to break, but fly into the first two turns almost full blast making every little move very crucial. Exiting the first two repeaters Keola gets ejected and thrown, loosing his board into the jungle. The remaining three riders rush through the last seven hairpins, staying close racing it out! Making it to the bottom first was the ultimate night owl, Ethan Lau. Taking his second series win in a row. Closely following him was local tanta shredder Dante. Coming in third was Nick. And fourth was Keola Chu... who eventually found his board. Following the finals, all of the riders bombed down the rest of the run... AWESOMENESS. and met back up for the awards. All racers were STOKED out with loads of schwag thanks to our sponsors. The podium racers even got a bunch of cash with it too thanks to Caliber Trucks. Half way done with the races and its been a blast! Huge mahalo to all of the racers for coming out and shredding hard. Also all of the riders would like to thank the SPONSORS for hooking us up, its really helping the scene here grow stronger then ever. The next race is on December 20 & 21 on the island of Maui. DOUBLE POINTS EVENT. Dont miss it! Info will be up on the site ASAP. All things considered this is a noteworthy issue looking by the majority of the general population. The arrangement that you partook in this article to taking care of this issue is extremely utilitarian and substantial but now you can choose essayhave to manage your task. Individuals can satisfy this issue subsequent to applying these arrangements. A debt of gratitude is in order for sharing these tips. HWOS 3. Full Results & Times.